All BoaGrip™ rigging slings feature patent SuperStick polymer traction bars, for fast, tight grip. Plus the unique Double-D™ stainless steel master link, to prevent twisting, binding, or bunching. Select a model for your use. Until now, the only way to get a good grip on the shaft of a tapered pole was to spend time rigging up a clamping device. 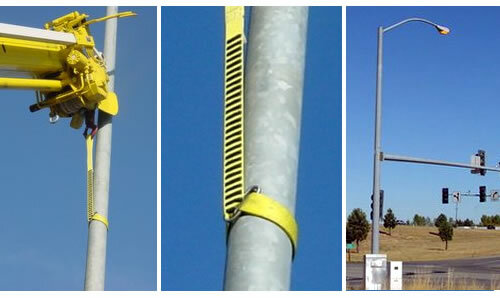 Safe Shop Tools has solved this rigging problem by bonding patented slip-resistant polymer traction bars to a nylon rigging sling, using a proprietary process. When the BoaGrip rigging sling is slipped around a pole and pulled taught, these SuperStick™ grippers are forced onto the pole’s surface; more force produces an even tighter grip. 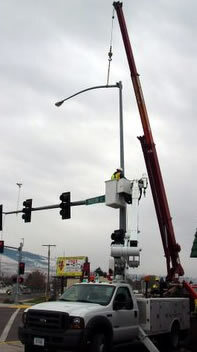 And the unique “squeezing” action saves time and manpower, because now crews can simply pick a spot anywhere above the “tipping point”, rig the sling, and be ready to lift. Without clamping. And without jerry rigging. This superior grip is further enhanced by a unique stainless steel Double-D™ master link that’s sewn onto the lifting end of the BoaGrip rigging sling. 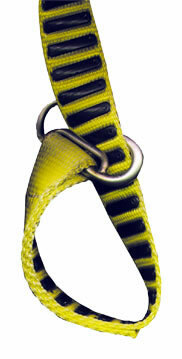 A conventional nylon rigging sling has a simple sewn “eye” at either end; one eye slips through the other to form a choker, but the rigging sling has to be slightly twisted. By comparison, the BoaGrip rigging sling’s Double-D link ensures that the gripping surface is held flat all around the pole.